Union Minister of Environment, Forest and Climate Change, Dr. Harsh Vardhan has said that Tiger-bearing forests play a mitigative role in combating Climate Change, besides the value of ecosystem services, provided by Tiger reserves. Addressing the Global Tiger Day celebrations at Vigyan Bhawan today, the Minister emphasized that the Tiger is a symbol of healthy environment and there can be no let-up in conservation efforts, as threats to Tigers remain ever persistent. Addressing a large gathering comprising tiger conservationists, NGOs and students, Dr. Harsh Vardhan pointed out that the target of doubling the number of Tigers by 2022 in St Petersburg Declaration is a moderate target, but even to achieve this moderate target, nations have to be repeatedly reminded to conserve the Tiger. He added that Tiger conservation should be carried out every moment of the day and not celebrated merely as a one-day event. The Environment Minister strongly impressed three points upon the children present on the occasion – to undertake one small good deed everyday and inspire others to undertake one such good, environment-friendly deed for the protection of environment and Tiger conservation, to live and work for fellow human beings and to put their heart and soul in undertaking such deeds with honesty and sincerity. “If each individual undertakes one good, environment-friendly deed every day, we would have performed 125 crore good, environment-friendly deeds”, Dr. Harsh Vardhan said. He added that the day this happens, India will regain its place as the world leader. The Minister suggested that there can be no better and positive messengers to spread any message in the society than children. Dr. Harsh Vardhan strongly emphasised the need to instill discipline in children particularly by teachers, which he said, should not be ignored at any cost. A Protocol for conducting security and audit of Tiger Reserves was released by the Minister on the occasion. A Compact Disk (CD) on glimpses of Tiger conservation through Parliament questions was also released. Actor Mr. Randeep Hooda, a Tiger enthusiast, termed the Tiger as the symbol of Indian heritage. He urged people to themselves become the agents of change in this regard. A radio jingle on Tiger conservation was also released on the occasion by the Environment Minister. Due to the ongoing conservation efforts under Project Tiger, India has the maximum number of Tigers, along with its source areas amongst the 13 Tiger Range countries in the world. 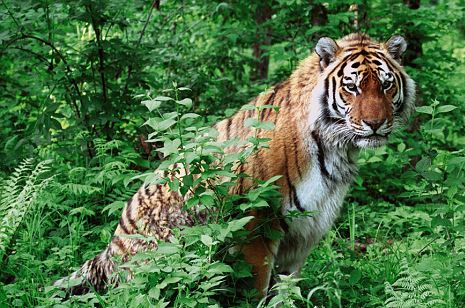 India is well on the path to contribute to the Tiger Range by the year 2022 in tune with St. Petersburg Declaration. The Global Tiger Day was celebrated with much fanfare. The celebrations also included two “Nukkad Natak” (street plays) by enthusiastic children on Tiger conservation. Besides the street plays, two songs on Tiger conservation were performed by Mr. Sujay Banerjee, an Indian Forest Service officer of Uttar Pradesh cadre and well-known singer, Mr. Abhishek Ray. More than 1, 000 school children cheered the presentation of the street plays and the songs. Forest Minister Assam, Ms. Pramila Rani Brahma, Minister of Forest and Environment of Odisha, Mr. Bijayshree Routray, Forest Minister of Chhatisgarh, Mr. Mahesh Gagda, Forest Minister of Uttarakhand, Mr. Harak Singh Rawat and Forest Minister of Madhya Pradesh, Mr. Gauri Shankar Shejwar, as well as senior officers from the Ministry of Environment, Forest and Climate Change and National Tiger Conservation Authority (NTCA), Global Tiger Forum, WWF attended the celebrations and also addressed the gathering. The compilation of "Glimpses of initiatives taken for Tiger Conservation in India based on Parliamentary Questions and Replies" includes significant environmental information discussed amongst India's Legislators and Policy Makers in both Houses of Parliament- Rajya Sabha and Lok Sabha. The publication comprises the concerned environmental issues and affairs in India in the form of a Compact Disk (CD), which is useful for ready reference by scientists, policy makers, technocrats and other concerned with the cause of conservation and sustainable development. The report describes the questions and answers raised in both houses of Parliament focusing on Wildlife Management issues which is quite germane for Tiger Conservation in 5 years. Several steps have been initiated by National Tiger Conservation Authority (NTCA) for tiger conservation and protection including legal, administrative, financial, international cooperation and other miscellaneous steps and Standard Operating Procedures (SOPs). Several steps have been initiated by National Tiger Conservation Authority (NTCA) for tiger conservation and protection including legal, administrative, financial, international cooperation and other miscellaneous steps and Standard Operating Procedures (SOPs).